This memorial keepsake ornament is a beautiful and meaningful bereavement gift that will be treasured by the recipient for many years. This ornament has a place for a loved one's photo. Also enclosed is an engraving plate which we will personalize for you if you desire with a name and dates. 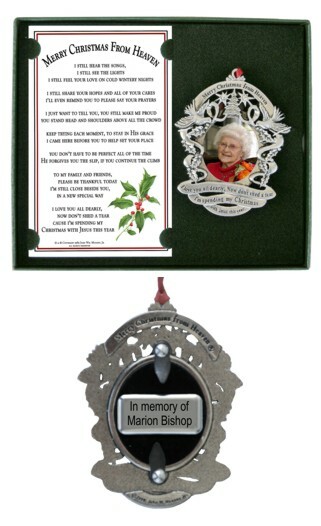 This memorial ornament is packaged in a keepsake gift box, along with a card containing the complete John Wm. Mooney Jr.'s poem, "Merry Christmas from Heaven". The ornament is engraved on the front with the inscription across the top "Merry Christmas from Heaven". Below the photograph opening is the inscription "I love you all dearly, Now don't shed a tear, I'm spending my Christmas with Jesus this year". The back of the ornament may be personalized by engraving on the attached plate with two lines of lettering. The ornament is hung on a red satin ribbon.